Every week T-Rex's teacher sends home a list of sight words. This weekend, I knew that T-Rex could benefit from some more review, but he was not interested, until I told him how we were going to do it. T-Rex named this activity Word Well, and I was amazed at how enthusiastically he participated. Each week, I ask T-Rex to read through the site word list, then I write the words that he cannot identify on index cards to use in review through out the week. This particular activity also called for a string, a bucket, and a tree. 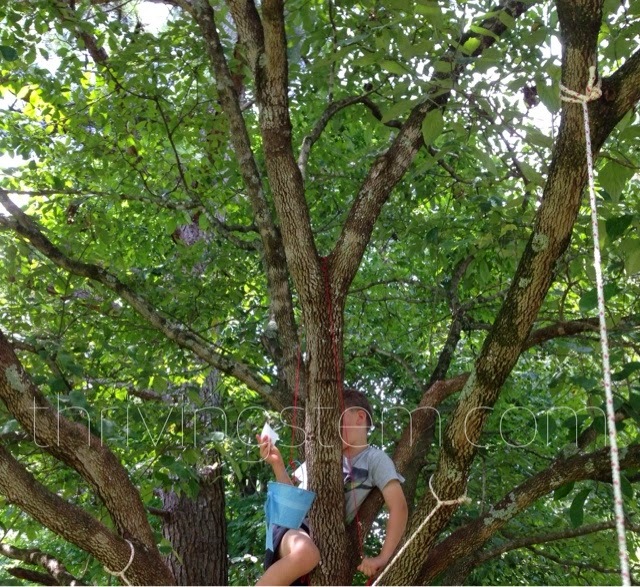 WARNING: String in a tree creates the possibility of strangulation. Please, make a wise choice for your family. 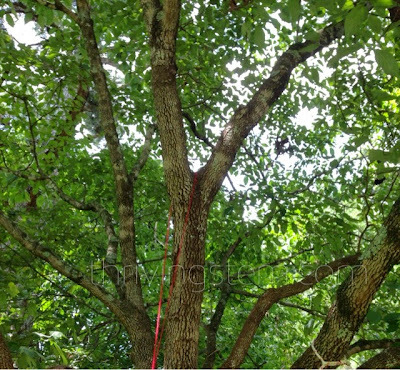 I would never allow ropes unattended, when the children involved are not inclined to follow directions, or when I cannot physically remove them myself if needed. 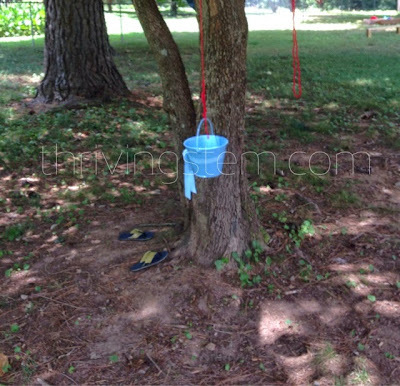 First, I tied a string to this bucket. Next, T-Rex looped the string through a fork in the branches. For our first round, I told him the word, then sent it up in the bucket. He took the card from the bucket, read it and sent it back down. For our second round, I sent two words up, and told him which word to send back to me. For the third round, I would have sent up all the words and asked him to tell me which words he was sending back. Pony Artist wanted a turn though, and the afternoon moved on. I am sure we will come back to this another day. If you do not have a tree readily available, you might use a set of stairs or a high piece of furniture to get the same effect. Why does this activity work so well? It is fun. Any good teacher knows that the lesson is on track when the student enjoys it. T-Rex's enjoyment of this exercise more than made up for the extra time it took, because he was engaged in the process. But why was he engaged? It uses science. Naturalist is one of Gardner's Multiple Intelligences just like Spatial and Kinesthetic, but it is often ignored in the lower grades. Adding a little bit of science to a lesson makes it easier and more satisfying for many learners. In this case it also provided Kinesthetic and Auditory stimulation as well. Can you think of more ways to use science to make learning fun? I would love to hear them! My daughter will be bringing home sight words this year and I've been gathering ideas to make practicing them fun. This one is going on the list! We don't have a tree, but a structure at our local park will work great! This is an awesome activity Christy! Thank you for sharing on Movement Monday at The Inspired Treehouse! I love how you combined whole body movement and learning! Thanks Lauren! I am glad you liked it. Thanks! You are building a great collection of resources!